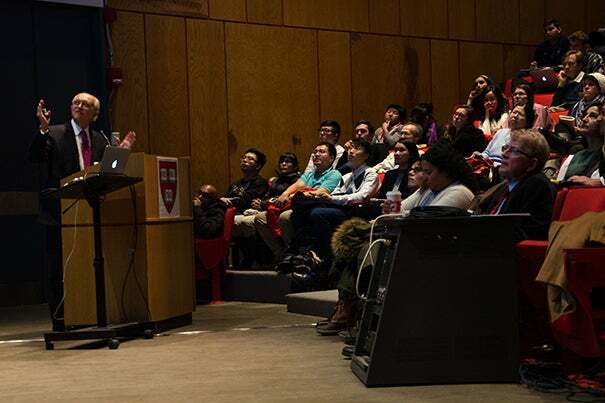 Nobel laureate Mario Molina told his Harvard audience that the U.S. appears closer to taking the “business as usual” path of increasing carbon dioxide emissions rather than making the cuts needed to avoid dangerous global temperature increases. Molina, distinguished professor at the University of California at San Diego’s Scripps Institution of Oceanography, won the Nobel Prize in chemistry in 1995, with F. Sherwood Rowland and Paul J. Crutzen, for his work on chlorofluorocarbons and atmospheric ozone. Molina and Rowland’s 1974 paper in Nature highlighted the threat to ozone high in the stratosphere, which shields the Earth from cancer-causing ultraviolet rays.